Living in Paris is a dream for a foodie like me. I’ve been here for 2 years now, so have plenty of great restaurants and bars to recommend that I go to on a regular basis. They are enjoyed by tourists and locals alike, and fit in well with sightseeing as I often go to these places when I have friends in town. Enjoy! 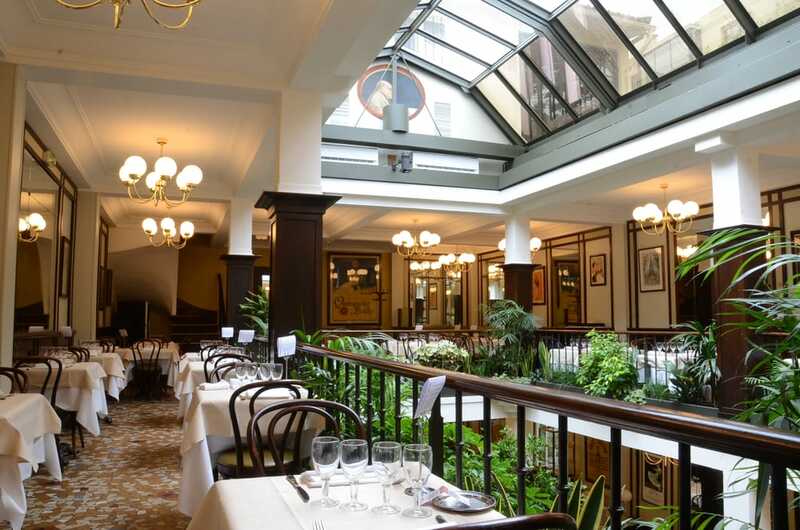 Le Relais de Venise is à parisien institution, serving only steak frites and 2 rounds of it to boot! The only question you’ll have to answer is “quelle cuisson?” (How you want your steak cooked) to which you should probably reply “saignant” or “a point” (rare or medium). You’ll have to queue but I promise it’s worth it for that special secret sauce! Make an evening of it by visiting the Hyatt Regency Hotel for cocktails before dinner and the best view of the Eiffel Tower. Gypsy jazz bar ‘l’apostrophe” on a Thursday or Friday night will give you the pleasure of listening to the best gypsy jazz musicians around. The food there is nothing special, but worth it if you like live music as you have to eat there to get the good seats where you can see, but you should either arrive early (8pm) or reserve. You can also go after dinner and stand and have drinks. It’s near Republique where there’s lots of interesting bars. Or if you fancy trying some excellent cheese and wine head to La Vache dans les Vignes first, through they do have cheese boards at l’Apostrophe too. This place is perfectly placed for a glass of wine of lunch when exploring Montmartre, it’s a touristy area so good to think about where you’re going to eat first to make sure you never waste a meal! No trip to Paris is complete without a wander in the streets of Le Marais, it’s full of great shops and restaurants, you’ll be spoilt for choice! This one takes the biscuit for me as its on my favourite street, and will reward you with views (and photos I’m sure) of a quaint pedestrianised avenue so quiet you’ll forget you’re in Paris! Fancy a crêpe on a quintessentially Parisien market street after walking in Jardin du Luxembourg and through the Latin quarter? This is the place. There’s a ton a creperies on this street including a famous greek one with queues out the door throughout the day, but who comes to Paris for a greek crepe? Come here to get the real thing from a Brittanic restaurant, and make sure to wash it down with some of Brittany’s finest cider or apple juice. ← Weekend City Breaks: Porto or Lisbon?